Photo Prayer 2018-14 Where Am I? but some go straight through. Will the next one crush me? far from where I belong. How I got here, I do not know. Perhaps abandoned. Perhaps pushed. Misplaced. and a life beyond my past experiences. 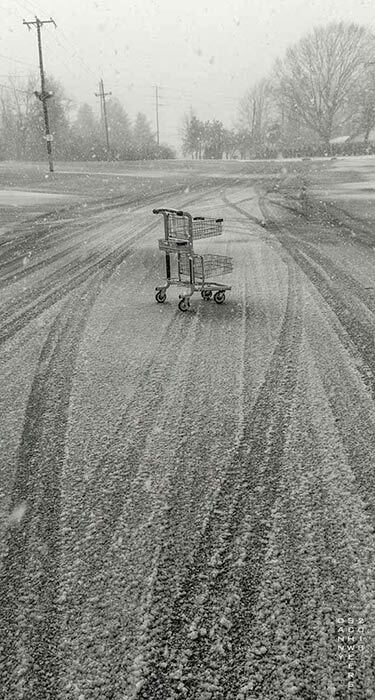 Photo of lost shopping cart in a snow storm..
Photo copyright 2018 by Danny N. Schweers. Text copyright 2018 by Maryann Younger. Wow. Great one this time. Thanks! Beautiful image...so evocative. Love it! What an apt message for these days! I can't believe how inhospitable our nation has become to refugees and immigrants. The poem reminded me of the people I used to visit who were confined behind barbed wire in a converted Nike missile base at the edge of the Everglades, just west of Miami. I was a part time chaplain to people who didn't have the necessary papers. Some were from countries that would not accept them back. They were in limbo, and confined for who knew how long. Jesus and his family were refugees. If they were to knock on America's door these days would we let them in? This is one of my favorites Danny. I love this. Thanks for sending. Ok, so this is a very cool shot….. I’m gonna have to think about this one for a while… Brings to mind those old time cartoons where one character is chasing another and comes to an obstacle in the middle of the road. He doesn’t go around it, but his legs expand and separate with cartoonish elasticity as they bow out and he goes over it, and keeps speeding down the road…. This evokes an “Ah, yes” response! Thanks! Poor abandoned, lonely shopping cart! ;) Love this. I read this weekly reflection on a plane to Luxor EGYPT. Of course I did plan and book the trip but am traveling there alone and have had a few anxious thoughts and comments from those around me. When I committed to go it was for this very reason; to step out of my comfort zone. Nothing ventured is nothing gained Confucius said. Thanks. I needed this week's affirmation.